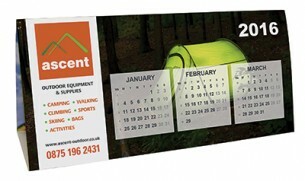 For a simple and cost-effective branded giveaway for any situation, the Smart Calendar - Quad is a great choice. This attractive calendar sits on its own on any desk, table or windowsill, and it displays three months on each side for quick reference. It's perfect for anyone who works at a desk, but especially secretaries and personal assistants. Your branding will look stunning displayed on each side, and we will print this item for you using litho print or digital print. Print area 80 x 40mm and 10 x 140mm.